I love when blueberries go on sale! I buy a ton of little cartons and freeze them. Here is my favorite blueberry recipe. So quick and easy, you don’t have to make it ahead of time. Just put it together while you are cooking your pancakes! It would be delicious on pound cake as well. 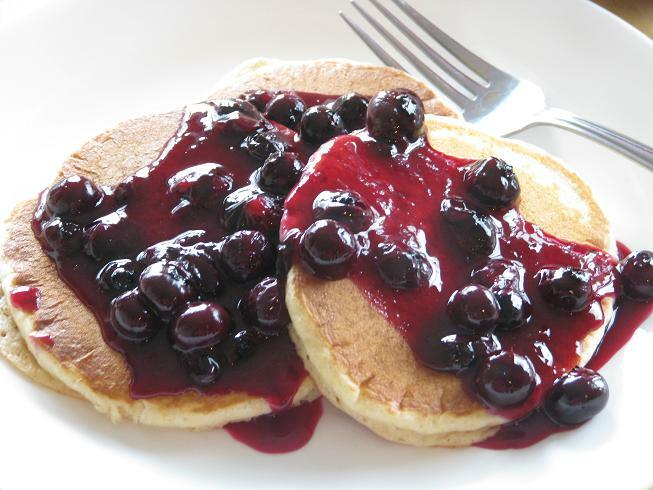 Combine the blueberries, sugar, and 1/4 cup of the orange juice in a medium-size saucepan. Warm the mixture over moderate heat, stirring it occasionally. While the berries heat, blend the cornstarch into the remaining orange juice, using the back of a spoon to dissolve any lumps. Increase the heat under the pan and bring the sauce to a boil. Stir the cornstarch mixture again and then stir it into the fruit. Cook the sauce at a low boil for 1 minute, stirring constantly. Remove the pan from the heat and stir in the lemon juice. Cool the sauce for 5 to 10 minutes before serving (it will thicken as it cools). Makes about 2 cups. YUM…. If I wasn’t allergic, I would eat that without putting it on pancakes! WOW!!! your pancakes look so YUMMY!!! This is a must try. huge fan of your blog, I check it almost daily! This looks so good! I’m putting a link to this recipe in a post on crazydomestic.com on August 19th. Feel free to grab our “I was featured” button!